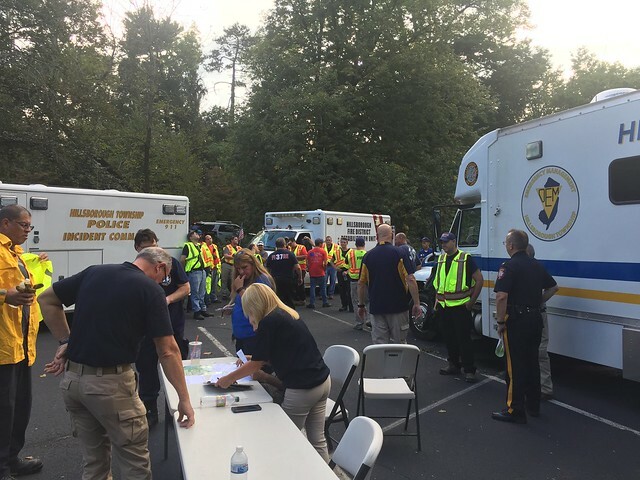 “Collaboration among various agencies led to a successful missing child search and rescue drill last month at Duke Farms,” reported Committeeman Shawn Lipani. Duke Farms was the setting for an extensive missing child search and rescue drill in which the following agencies participated: Hillsborough Township Police Department, Hillsborough Township Office of Emergency Management, Hillsborough Township Volunteer Fire Departments, Hillsborough Township CERT, RWJ-EMS, Somerset County Sheriff’s Department, Somerset County Prosecutor’s Office Dive Team, Somerset County Search and Rescue, and Duke Farms Security, Maintenance and other personnel. This training exercise was the first of its kind to be held within the Township. The expansive and diverse terrain of Duke Farms provided the perfect setting for this training exercise, allowing a variety of environmental settings for the rescuers to experience in the event of an actual situation. Duke Farms not only allowed full access to the facility but also provided a training room in the Coach Barn and dinner for all the participants after the drill during the debriefing. “Duke Farms has been a valued partner for the Township and we are thankful for their continued support,” concluded Committeeman Lipani.